Okay, I went through the compatibility list and most of the posts in this thread, and failed to find my cam. I did not buy this for the tracking - I already had it, so I just want to know if anyone else out there has experience with using it for this purpose. My cam is the Microsoft HD-5000. Doesn't look like it will come apart easily, so I hope I can use it straight up. A4Tech PK-30MJ impossible to remove IR-filter. 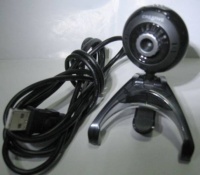 I bought a webcam A4tech PK-7G. Nothing can `t turn off auto exposure in the darkness falls to 5PS. Has anyone tried this camera, as it turn off the damn auto exposure? google for a tool named "windows enabler. "With this tool you can disable your auto exposure. I'm sad to admit it, but I probably clubhand. 1. Put a check on autoexposure, the slider moved to 0. 2. In the camera to direct light from the lamp, and waited 30 FPS. 4. Turned the light on the camera and the FPS drops to 5. "Windows Enabler" hung in the tray icon with ON, all the time. Logitech C270 worked quite good w/o ir filter removal. Just a piece of floppy filter in front of the lense. The cam now sees only black space, whatever I do. I ordered a new one. 2. With my new cam. is there another easier way to remove the ir filter without damaging the CCD? and it´s working great in native resolution of 352*288px @ 45 fps in RGB 24 with a wide angle angle of 72 degrees. No IR filter removed; only a piece of photograph film to block visible light. The trick is to start the camera in FT with the lens covered to obtain constant 45 fps, really happy with it, Free-Track is amazing [even with my improvised 3point clip with IR leds]. Edited by moss on 15/09/2015 at 12h48. I can recommend the Xbox360 Livecam, I'm using it for two years now. - It can be bought very cheap (got mine for 11 euros). - It can be modified easily. - It has good driver support in Windows XP/Vista/7 (haven't tested 8 but will probably be ok). - It has a good framerate (60 fps at 320x240). - It has a wide field of view. The only disadvantages I can think of is that it doesn't have a display stand, but that is nothing a bit of metalwire can't solve. And I think it overheats after extended period (few houres) of use which causes it to give a poor framerate, though I'm not sure about this yet. I am using MS VX 1000 for 3 years. With Enable button program it can give 30 fps with <10 jitter. After some time it rarely can reduce fps to 24-27. I can recommend it as a very good camera. - its cheap, cost ~7$ new. - camera is very light so I had to use duckt tape to stick it on tv. - it has 6 blinding leds without twilight sensor. you have to remove them or use electrical tape. 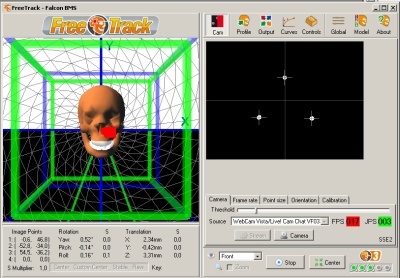 Camera working via splitcam in 28fps 640x480. Tested with ETS2 demo and its working well. ps. In "Your point model constructions" topic I posted a video of my freetrack construction. Edited by oldsu on 03/11/2013 at 20h39. Looks like this in a dark room, with 3 SFH485p LEDs at 60mA. There's an option to select 30FPS at 320x240. I don't know if I'm doing something wrong, but it won't go higher than 17FPS in FreeTrack. I got this to on my Logitech. Try to reinstall the driver and use it on an other USB port. Turn on AE, shine with a bright light into the webcam.Now you will see the fps go up, turn off AE and now your fps will stay on 30fps. 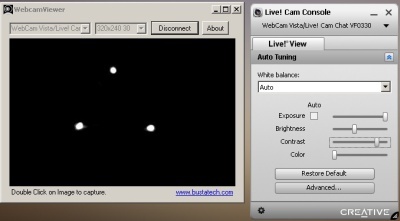 I use a ms vx3000 webcam, without doing this I have the same problem. What is that button auto Tuning? Installed the latest drivers from the Creative website and tried connecting it to the USB ports directly on the mobo, but it still won't go above 17FPS. Thanks for the tip, I tried the autoexposure/light trick and it didn't work properly. It shows 30FPS, but I'm getting a massive delay between actual head movements and the camera (1 second). Which auto tuning button do you mean? Edited by justonce01 on 11/11/2013 at 17h05.